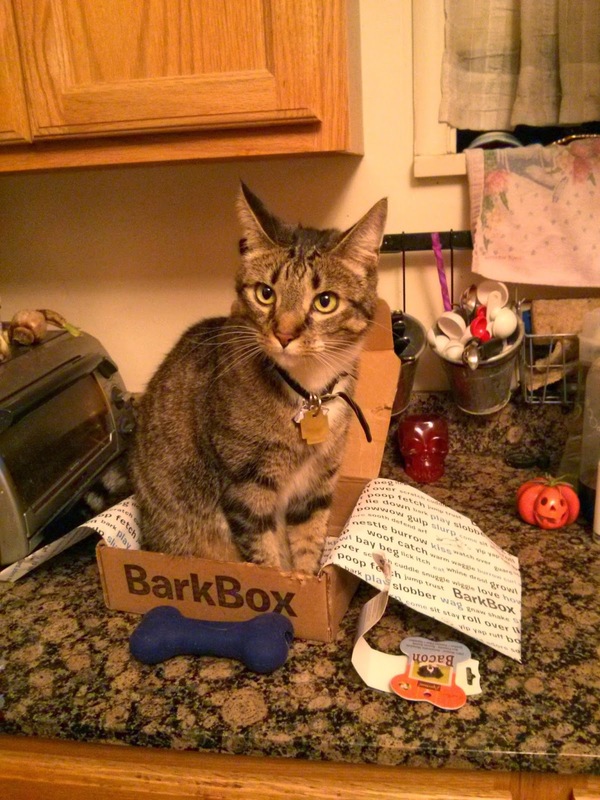 Our March BarkBox arrived! 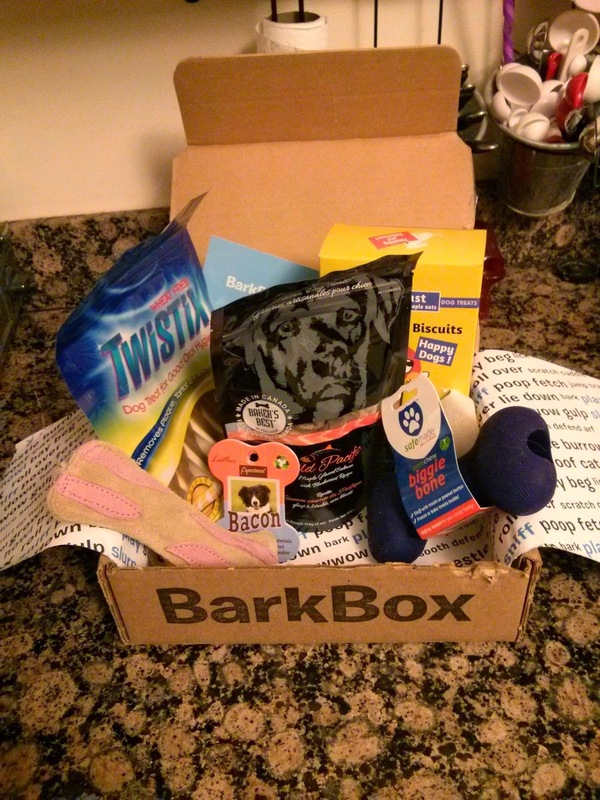 I just signed up for BarkBox last month, this is a monthly package of dog products you have probably never seen or heard of. The idea is to teach your dog that the mail carrier is a friend bearing goodies. As our mailman comes without gifts the rest of the month, Brisbane remains unconvinced. He's pretty sure the mailman must be destroyed. Forget the cute picture, we're opening this thing! This month's BarkBox contained a bacon-shaped stuffy made of leather, by Aussie Naturals. Brisbane was more interested in the edible goodies in the box, so the bacon hasn't seen any action yet. We also got a Safemade stuffable toy that is both freezer-safe and oven-safe. This is a novel concept, and I'll have to consider what I'm going to bake into this thing. The Safemade bone looks pretty cool, and I'm all for stuffable toys, but I almost feel like the safety concept might be a bit overstated. I feel like I'm pretty good at discerning safe toys from major hazards for my particular dogs. I'm paranoid enough to not give them most dollar-store toys, but that's about it. We got three different kinds of treats. The Twistix are chewable dental treats, these are size large. Nowhere does the package state what "large" means or whether I should avoid giving these to my 6-lb ankle-biter, unlike a lot of dental chews. Like most dental products, I am skeptical that these will contribute to my dogs' oral health. However, they are probably tasty and fun to gnaw. I haven't opened the Baker's Best Wild Pacific salmon blueberry treats, but they sound pretty stinky from the description. Brisbane loves stinky treats, and finds them to be much higher value than anything I would like to keep in my pockets. These will probably end up stuffed inside various toys, unless they end up being smelly enough to use as training treats. The Wagatha's Breakfast Biscuits are made with apples, bananas, and cinnamon. Definitely pleasant-sounding. They are bone-shaped and adorable, but probably not stinky. I'm sure someone around here will eat them anyway. I have been pleasantly surprised that both of our BarkBoxes have been totally Brisbane-allergen-free. No poultry, no eggs, no problem. There isn't an opt-out option for dogs with allergies, and I was fully expecting to be giving several items away each month. 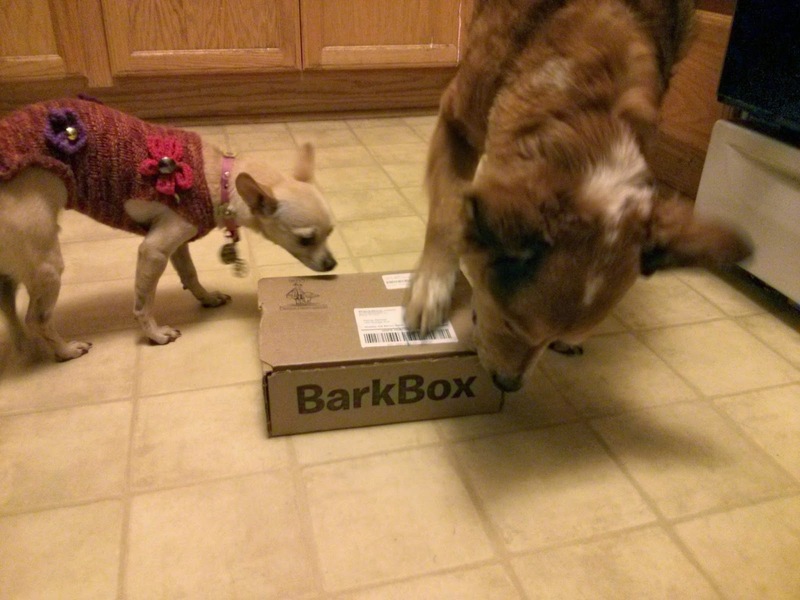 So far BarkBox has exceeded my expectations and introduced me to several products that were not available locally. I would never have bought any of this stuff myself, and I have been delighted with everything I have received so far. I highly recommend BarkBox, and totally think everyone should sign up for it and claim me as the person who referred them so I can get free BarkBoxes.